Handmade candles make lovely gifts. Holiday candle crafts are a great choice for anyone in search of unique Christmas presents. When purchased in bulk, candle making supplies are very affordable for those on a tight budget. Your candle is a one-of-a-kind creation that's unlike anything purchased from the local mall. Candle scents and colors can be customized to match the recipient's décor. For a special gift, try decorating candles with your favorite family photos. This easy project requires no previous candle making experience, since you're merely embellishing a previously purchased candle. Inkjet printer. To ensure the most vibrant colors, check ink levels before beginning your project. Tissue paper. Don't use tissue paper saved from previous gift wrap, since the paper needs to be free of wrinkles and creases. Plain candle. You can use whatever scent you wish, although light colored wax will ensure the best image. Heat embossing gun. A hair dryer will work in a pinch, but it will take much longer to melt the wax. Wax paper. Look for this in the baking supply section of your local grocery store. Print your photo on a small sheet of tissue paper. If you don't want to make a personalized photo candle, simply use the clip art image of your choice. 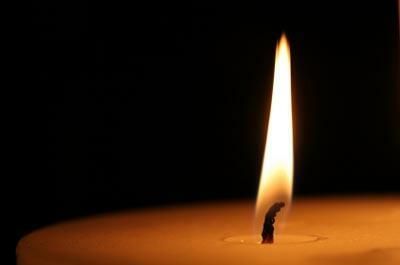 Place the tissue image around your candle, taking care to smooth out any creases. Wrap wax paper around the entire candle. Use your heat embossing gun to gently melt the candle wax. As the wax melts, the tissue paper will seem to magically disappear. Remove the wax paper to reveal the image that is now embedded into your candle. Ice candles have a unique textural look. Filled with interesting cracks and crevices, these candles often resembled modern art sculptures. A mold. If you don't have access to a pre-made pillar candle mold, use a cardboard milk or juice container. Paraffin candle wax. If you don't want to purchase candle wax, try melting old crayons or the wax from previously purchased candles. Small white tapered candle. Using a tapered candle makes it easier to ensure that the wick is set correctly, especially if you are working with young children to complete this project. A small cup of ice. Chop the ice into small chunks to ensure the most attractive looking candle. Color and fragrance as desired. For extra pizazz, try making an aromatherapy candle that will boost your energy level or calm your frazzled nerves through the power of essential oils. Melt small chunks of candle wax in a double boiler. To ensure that the wax doesn't become too hot, try to keep the temperature between 170-180 degrees. Add color and scent as desired. Pour approximately ½ inch of wax into the bottom of the mold, then insert the small white tapered candle and wait for the wax to harden. Spoon approximately two inches of crushed ice around the taper, then cover with melted wax. After the wax cools, repeat this process until the mold is full. Wait at least one hour for the candle to cool, then remove from the mold. Tie a pretty ribbon bow around the middle of the candle and attach a small gift tag. Present your candle in an accompanying homemade candle holder. Include the candle as part of a gift basket filled with matching scented soap or body lotion.